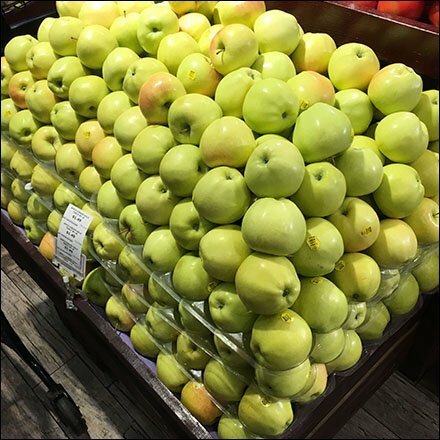 We all admire the skill required to create a professional pyramid of produce. But when that pyramid come crashing down, the result is bruised fruit, shrink and loss of profits. Look close at this Gourmanoff Gourmet Grocery display to see plastic trays maintaining the integrity of the lower levels of the pyramid. Nevertheless I would be afraid to pick through the offerings more than a layer or two, Documents at Gourmanoff Gourmet Grocery, where as you see, customers grocery shop with Louis Vuitton Bags under arm. For Produce posts by Title see..